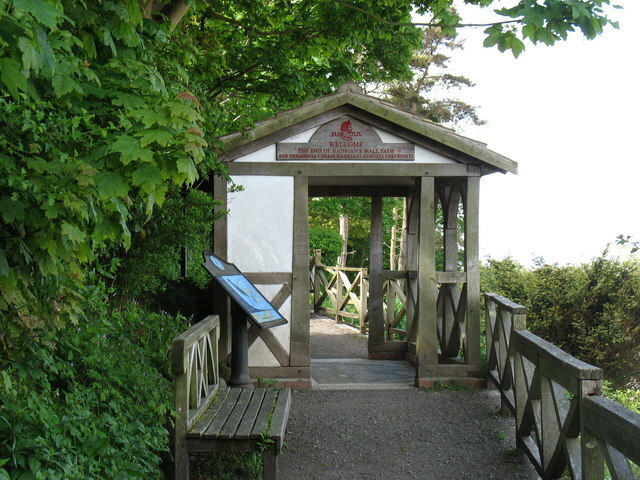 This pavilion at Bowness-on-Solway marks the end of the 84-mile Hadrian's Wall Path which starts at Wallsend (east of Newcastle). The greeting reads "Welcome. The end of Hadrian's Wall Path" (AVE TERMINVM CALLIS HADRIANI AVGVSTI PERVENISTI). Of course walkers going from west to east approach from the other side, and are then welcomed to the start of the path with "Good Luck go with you" (FORTVNA VOBIS ADSIT) - see Ian S's NY2262 : The start of the Hadrian's Wall Walk. There is a fine mosaic on the floor of the pavilion (see NY2262 : Mosaic at the Path Pavilion, Bowness-on-Solway (west) and NY2262 : Mosaic at the Path Pavilion, Bowness-on-Solway (east)).